Does Your Child Have Too Much Homework? Are you concerned about the amount of time your child spends on homework each evening? Perhaps you feel like your child is spending a lot of time on their homework, and they are not getting anything out of it. If your child is overwhelmed by homework, you can help them by examining their habits to find the source of homework trouble. Once you have identified the root of the problem, you can guide your child to a solution. While there are no set rules on exactly how much homework a child should have, there are some guidelines to help you decide if the amount of homework is too much or just right. The most common guideline is the 10-minute rule, which states that a child should have about ten minutes of homework per night for each grade they are in. With this rule, a first grader would average 10 minutes of homework, a second grader would have 20 minutes per night, and so on. The 10-minute rule is recommended by the National PTA and the National Educators Association. Keep in mind that it is a guideline—some high school classes and advanced work classes may have more homework than the general guideline. Often, teachers will send home a letter explaining their homework policy in the first weeks of school. This policy will often include more personalized guidelines, including how much time homework should take each evening. If you realize your child is spending more time on their homework than expected, you will need to do some troubleshooting to solve the problem. Is your child or teen sitting with their homework out, yet they are doing something else, like texting friends or watching a tv program. check to make sure they are focused on their work during the time they are working. You want to check this first hand. Your child or teen may simply not be aware of how distractions can impact their homework time. If you find your child is not focused on homework, use the following suggestions to help them stay focused during homework time. Your child or teen will benefit from having a specific place where they can work on their homework. The area should be someplace that is comfortable to work, allows for an age-appropriate amount of parental supervision, and access to any needed supplies or resources. Completing homework in a specific place will help reinforce habits. Your child will get used to doing their work in that specific spot. 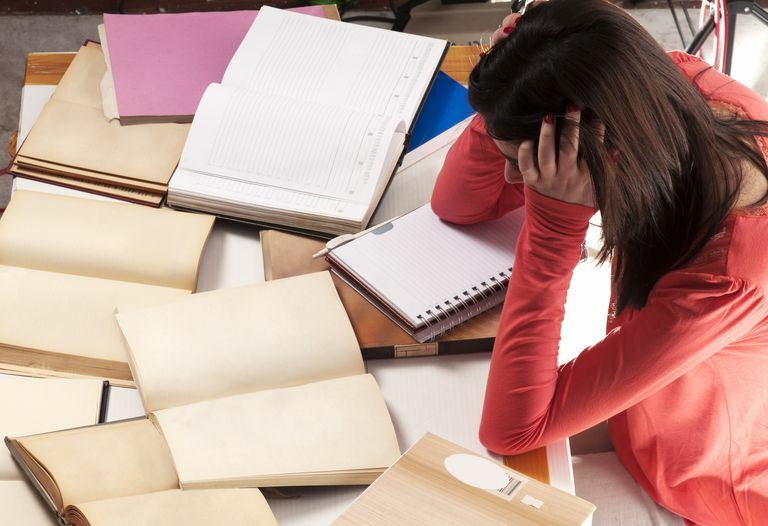 Sometimes, school-age children will put off doing larger homework assignments rather than trying to complete them a few days before they are due. Rather than spending 10 to 20 minutes for several evenings on the large assignment, they will have to spend hours to get the work done. Having a regular homework set time in their daily schedule will give them the time to work on their assignments on most days. Tweens and teens will need to make sure they keep track of the different due dates in their different subjects. Work straight through or take breaks? Remember that 10-minute rule stated earlier? That rule would lead to an eighth-grade student doing 1 hour and 20 minutes of homework each night. High school students can expect even more time on homework. If your child needs a break and tries to push through, they often find it difficult to maintain focus. They may be seated at the table, but their work will slow down or stop altogether. Some children and teens are able to sit down and work straight through until their daily homework is completed. Others may find they need to take a short break every 40 minutes. Some children or teens may also experience a condition that affects their ability to focus for long periods of time. Examples include ADHD, depression, and anxiety. Children and teens who struggle with focusing for long periods of time will need to keep their abilities in mind when they plan to do their work. They may benefit from a distraction-free area, splitting homework time between before and after school or another creative arrangement that accounts for their needs. Sometimes homework overload is not something that can be solved only at home. Your child does not know how to do the assignment. If your child or teen does not know how to do the work, they may take a very long time trying to complete it. Sit down with your child and watch them try to do their work. Do they understand the directions for the assignment? Are they missing skills they need to complete the work? If it is the first time your child has struggled to understand how to do the homework, encourage your child to discuss the problems with the teacher the next class session. If your elementary or middle school child is starting to fall into a pattern of struggling with work, you will want to be included in the conversation over the struggle with the material. If your child is in high school, use your knowledge of your teen to decide if they should handle it completely on their own. You want to let the teacher know quickly if your child cannot do the homework so that the teacher can help address any gaps in knowledge early. Nationwide schools are adopting rigorous curricula that build from grade to grade. Missing a skill in one grade level can lead to missing building blocks for following years. Fortunately, teachers can find ways to address gaps in learning. The earlier a teacher is aware of a gap, the faster the gap can be addressed before it becomes a larger gap in learning. Your child takes an excessive amount of time to complete their homework. Perhaps your child does sit down every evening in a distraction-free area and focuses on their school work, only an assignment that should 10 minutes actually takes 40 minutes. Your child might be working hard and know what to do, but they are very slow, especially compared to other kids in their class. This may be caused by a learning disability. Children with dyslexia may struggle to learn to read and then read very slowly. Children with dyscalculia, a disability in math, may take an exceptionally long time to complete work involving numbers, estimation, and math. Fortunately, there are teaching and learning methods that can help children with these issues once they have been diagnosed. Your child has multiple assignments due at the same time. This is a situation that you may only expect in high school when you know your teen will have several different subjects and teachers, each with their own calendar of assignments. Teachers may assign a large project with a due date right before or after a break, believing it would be convenient for everyone to have it due. Sometimes school calendars have other days, like the midpoint in a quarter, that seems ideal to have work due. It's often the convenience of certain dates in the schedule that can cause multiple assignments to be due in middle school. Children in elementary school who see different teachers throughout the day in an effort to individualize to skill level may be surprised to find themselves caught with too much work due at the same time. Ideally, teachers will plan out large assignments far in advance of the due date so that even if multiple subjects require work to be turned in on the same day, children can plan ahead and work slowly. Sometimes, this doesn't happen. Teachers are often somewhat isolated from one another in schools, each working in their own classrooms, so teachers may not even know that they are assigning work that will all be due at the same time. If your child has a truly unreasonable amount of work due at once, talk with the teachers involved. Some schools have set policies limiting the number of large tests or projects that can be due on a single day. Even if your child's school does not have a specific policy, teachers may be able to change due dates or come up with a plan that will allow your child to get the work done without being overwhelmed. Learning to get homework done regularly can help your child develop a growth mindset, where they know that their hard work will lead them to learn and opportunity. Finding ways to overcome difficult periods in school will also help your child or teen learn that they can find ways to meet challenges and be successful in school. National Educators Association, "Research Spotlight on Homework." NEA: Research Spotlight on Homework. 2017.